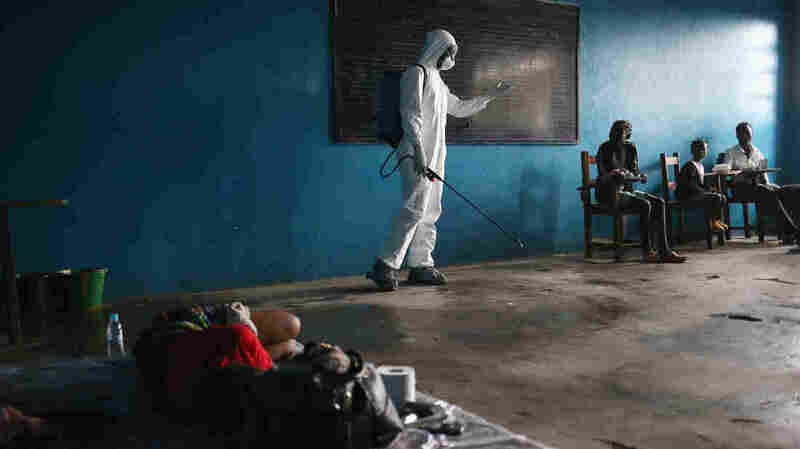 What Obama Should Say And Do About Ebola : Goats and Soda The president is expected to announce a new U.S. effort to help stop the Ebola outbreak. What kind of help should the U.S. provide? We asked two specialists. A health worker speaks with families in a classroom now used as Ebola isolation ward in Monrovia, Liberia. Ebola-stricken West Africa needs more health staff and more medical facilities. Tomorrow, President Obama is scheduled to announce a new U.S. plan to help stop the Ebola outbreak in West Africa. We offer two perspectives on what the president should say. One is from Sophie Delaunay, executive director of Doctors Without Borders, which has been on the ground in Africa since the first cases were identified this year. The other is from Dr. Amesh Adalja, an infectious disease physician at the University of Pittsburgh Medical Center who studies how to prepare health care systems for pandemics. Delaunay, who spoke to NPR last week, doesn't hold back. "I have to say that we are quite exhausted and angry about the situation," she says. "We believe that what an NGO [nongovernmental organization] like MSF [Medecins Sans Frontieres, her organization's name in French] does, a state can do at even larger scale. This is all we are asking. We really just want to stand in solidarity to the Liberians, the Sierra Leoneans and the Guineans. And in the face of this outbreak, we are really calling for additional capacity." Speaking of the role that the United States could play, she says that "thousands of people [at U.S. laboratories] are trained in working in highly contaminated environments" — and could offer guidance to health workers in Africa. "The most urgent need at the moment is to set up isolation units so that people who are sick do not contaminate the rest of the population," she says. "It is not technically complicated. It involves very basic organization to manage patient safety, to feed them, to provide them with water, to manage waste." She favors military participation in the anti-Ebola efforts. "What is critical in order to make this care successful is to have a strict monitoring, a strict supervision, a good chain of command. This is key. And this is why we do value the role of the military in this intervention and we would actually wish that there would be much greater mobilization of military assets and personnel, because they are much better equipped than any non-governmental organizations to put in place those kind of very strict and solid supervision from A to Z." From a practical standpoint, Dr. Adalja suggests that the U.S. provide the basics: portable hospitals, personal protective gear (gowns, gloves, masks, eye protection) and other scarce medical supplies like thermometers: "We know people are resorting to reusing thermometers." He also believes the U.S. can help educate African health-care workers on the proper way to wear personal protective equipment to minimize the risk of exposure. "The thing with Ebola is it's not a very complex disease to treat," Dr. Adalja notes. Basic measures such as controlling infection, isolating patients, tracing others with whom they may have had contact and promoting "hygienic burial" have brought past outbreaks to a halt. The same, he says, should be done this time.